I am very happy to introduce our third guest writer, Rena Maguire, to the blog. Rena is an undergraduate student at QUB, in her second year. She is currently working on her undergraduate thesis: Iron Age horse harness Y pieces: function, manufacture and typologies. 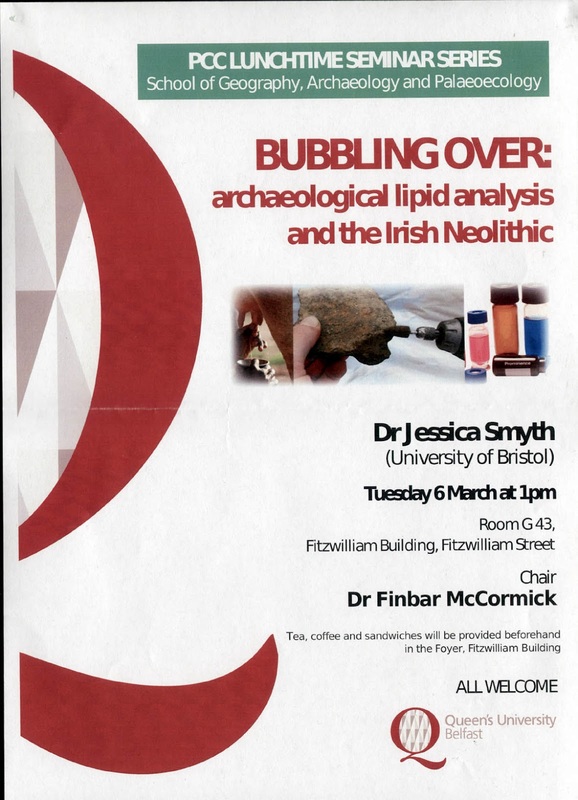 Being an archaeology and paleoecology undergraduate in QUB Belfast has perks, one of the best being the PCC Lunchtime Seminars organised by our department. I’ve personally found them invaluable to gain insights into sometimes quite obscure areas of archaeology. The guest lecturers are, as one would expect, at the cutting edge of their respective fields. Not least of these is Dr Seren Griffiths of the University of Cardiff, who gave a talk (March 20 2012) on Scatter Matters: Bayesian statistical modelling and evidence for overlap between the late Mesolithic and early Neolithic material cultures in England. Griffiths has been working with Professor Alasdair Whittle and Dr. Alex Bayliss on an ambitious project, examining links between culture, sites and practices at late Mesolithic and early Neolithic sites throughout Britain. Dr Griffith’s PhD was on the application of Bayesian modelling to dating early sites. There’s no doubt that the Bayesian modelling has revolutionised dating methods in recent years, as demonstrated by the seminal publication ‘Gathering Time’ (Bayliss, Healy & Whittle 2011) (review: here). Radiocarbon dates, even when calibrated, can be imprecise by a range of hundreds of years. Bayesian modelling checks each year of a radiocarbon date range against other data such as stratigraphic relationships of finds, and in doing so can reduce a date range to a couple of decades instead of centuries (Buck, Cavanagh & Litton 1996). That’s the science part out of the road! Dr Griffiths emphasised that the main purpose of any refinement of dating methods is to actually know what you want to date. Sounds obvious, but radiocarbon dating is just a number unless you know what to do with the information obtained, and that involves full analysis of taphonomy and association from any given site. Everything is residual, Dr Griffith emphasised, unless you can prove otherwise. This must take into consideration ‘uninformative prior beliefs’ as well as ‘informative’ prior beliefs, to create the Bayesian probability model. Using only what one thinks should be there is smearing the data, and enforcing one’s own agenda on what should be neutral mathematical figures. To move beyond simply obtaining dates and look at the dynamics of a site, Griffith states, one must produce assemblages of dates on material from related events within that period, and one can only achieve this through associations with the material culture of that society (Bronk Ramsey 2000). When you’re dealing with the material culture of the Mesolithic and Neolithic, you’re going to be looking at microlith technology. Dr Griffith had specific interest in the microliths of Yorkshire and Humberside, specifically some key sites such as March Hill and South Haw in the Pennines. While the Neolithic package arrived early in the Thames Valley region of Britain, it was adopted much later in the peaty highlands of the Pennines. Dr Griffith pointed out that because of the overlap of cultures, there really is no such thing as a Mesolithic or Neolithic date, or exact point of transition. Both cultures exist simultaneously in close proximity to each other. March Hill, in Yorkshire, which was excavated in the 1990s, shows continuity of occupation, with Trench 8 specifically containing two hearths from two different periods of time, with rod microliths recovered from each context. However, there is a change from chert rods to flint - the demonstration of material cultural change (Spikins 2003). The similar association with material culture can be shown by the assemblage of microliths found with the Lydstep Pig. These upland peaty landscapes demonstrate the relationship between landscape features and material culture. It is within the Pennines that Mesolithic lifestyles persisted when the rest of Britain had embraced the Neolithic package of domesticated animals, cultivation of grains, and pottery production. Dr Griffith presented a view of an eventful Mesolithic history from around 4100 BC, rather than a people clinging to the past. Close to March Hill Top and March Hill Carr, as well as the South Haw sites people had already adopted the Neolithic way of life. These people were closer to the coast, perhaps more open to outside influences than those in the rugged uplands. At any rate, Bayesian modelling shows the period of 4100-4000 BC as a period of dynamic transitions in Britain, and demonstrates the speed with which cultural changes occurred after this overlap period. I won’t pretend that I know very much about Bayesian modelling. Therefore I hope I have done some form of justice to the mathematical side of Dr Griffith’s presentation. What I was impressed by was the acknowledgement of our pre-conditioned ideas about the transition of the Mesolithic to Neolithic period. Call it iconoclasm, but I rather relished the idea of no preconceptions of dates and relying purely upon material evidence, and how it relates to dates gathered. I for one came away from this seminar resolved to purchase some books on Bayesian theory, which now made an awful lot more sense than it had before! Bronk Ramsey, C. 2000 Comment on 'The Use of Bayesian Statistics for 14C dates of chronologically ordered samples: a critical analysis' Radiocarbon 42.2, 199-202. Buck, C. E., Cavanagh, W. & Litton, C. 1996 Bayesian Approach to Interpreting Archaeological Data (Statistics in Practice). London. Spikins, P. A. 2003 Nomadic People of the Pennines: Reconstructing the Lifestyles of Mesolithic People on Marsden Moor. London. Whittle, A., Healy, F. & Bayliss, A. 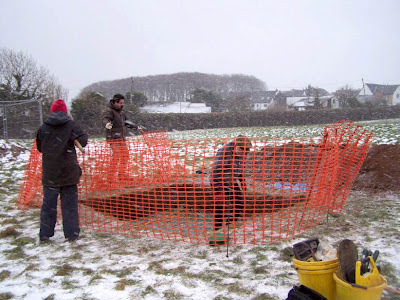 2011 Gathering Time: Dating the Early Neolithic enclosures of Southern Britain and Ireland. Oxford. If you’re going to do any shopping through Amazon, please go via the portal below. It costs you nothing, but it will generate a little bit of advertising revenue for this site! In my review of Anne Lynch’s recent publication Tintern Abbey, Co. Wexford: Cistercians and Colcloughs. Excavations 1982-2007 I touched on the finding that some of the women buried at the Abbey may have routinely carried heavy loads perched on their heads. To be specific, O’Donnabhain (2010, 116) notes that among the sexed females from the site, there was a marked increase in the rate of osteophytosis in the neck than among the males. He notes that this observation correlates with an elevated rate of arthritis of the cervical vertebrae. Taken together, it is postulated that these conditions are evidence for the routine carrying of loads on the head. No published references are cited in support of this thesis. Similarly, no parallels are drawn with any comparable excavated skeletal collections from Ireland or elsewhere. From this I understand that this is O’Donnabhain’s own theory. On one side, it is an interesting speculation, consistent with the available evidence. On the other hand, it is an observation not confirmed, as far as I am aware, in other excavated collections. Of course, I realise that every change in our knowledge has to start somewhere, possibly with someone bravely putting their head above the parapet to announce a previously unnoticed fact. At one level my reservation about this theory was its apparent lack of confirming data. At another level, I feel than my aversion to this proposal was that it seemed too alien to my understanding of the Medieval past. I am familiar with the sight of African and Asian women carrying loads in this manner, but to transport it to Wexford seemed too much – it seemed ‘un-Irish’. In short, I had plenty of reasons to like this intriguing and interesting speculation, but just as many if not more for suspecting that it may be a bit thin on evidence. That is probably where the matter would have rested for me. However, over Christmas 2011 my mother, Maureen Chapple, and my sister, Katie, came to stay with my family and I in Belfast. One evening our conversation touched on the fact that in the new year (February 2012), my mother would be going to Kenya to assist the Building of Hope charity. In the course of the conversation we discussed the traditional African method of women carrying objects on top of their heads. As an aside, I mentioned that I had recently read and reviewed the Tintern Abbey publication and how a number of Medieval skeletons there had shown evidence of just such a practice. I remarked on how I thought it was probably quite a local phenomenon, restricted to that part of Wexford, around that time. That was all well and good – properly scientific and logical - until my mother spoke up. 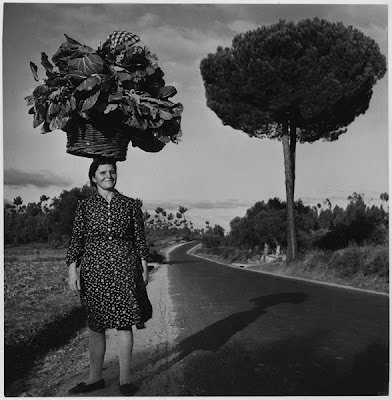 She told me that her Grandmother (my Great Grandmother) was well known in the area where I grew up for being able to balance a full bucket of water on her head and carry it home. Honor Mannion (nee O’Toole) was born around 1869 in Killeenaran, County Galway. She married my Great Grandfather, John Mannion, in 1900, and died in 1947 in Lissindrigan, near Craughwell, Co. Galway. My reason for placing this anecdote on record is to, hopefully, increase the body of knowledge surrounding this method of portage in Ireland. Until I found out about the example from my own family, I was quite willing to downplay, if not wholly discount, O’Donnabhain’s speculation. It may have been an interesting interpretation of the evidence, but it would have been quite unlikely – or so I thought. Now I am starting to wonder what other information is out there? Are there more stories of Grannies carrying heavy loads around, perfectly balanced on their heads? Does anyone have a photograph of an aged auntie doing just that? On its own it may have seemed odd, but as part of a larger body of evidence it may just be a glimpse of a lost tradition. For the archaeologists of Britain and Ireland reading this – do you have osteo reports that show elevated rates of osteophytosis in the neck for female burials? Perhaps these may be interpreted or reinterpreted in terms of head carrying. Maybe it is time to gather up the evidence and reclaim head carrying as an Irish tradition. I am indebted to my mother, Maureen, for providing me with this anecdote and to my sister, Kathryn, for providing me with the names and dates from her genealogical research. I also wish to acknowledge the assistance provided by archaeologists Áine Bradley and Philippa de Barra. Thank you all very much. Building of Hope is a county Clare based charity. Their 2012 project is to construct a residential care centre for blind and partially sighted children in Likoni, Mombasa, in Kenya. They are a wonderful charity and worthy of your support. A Google search on this topic brings together quite an interesting collection of references to research, videos etc. on head carrying. O’Donnabhain, B. 2010 ‘4.3 The human burials’ in Lynch, A. Tintern Abbey, Co. Wexford: Cistercians and Colcloughs. Excavations 1982-2007. Dublin, 105-125. If you’re going to do any shopping through Amazon, please go via the portal below. It costs you noting, but it will generate a little bit of advertising revenue for this site! Thank you. St. Patrick’s Gravestone: A Bigger fake! I hadn’t intended to write anything for this blog specifically about St. Patrick or St. Patrick’s Day. However, I happened to read the rather excellent post about the death and burial of ‘Ireland’s Patron Saint’ by Cultural Heritage Ireland [Facebook Page | Twitter]. The post quotes the Annals of Ulster and the Annals of the Four Masters’ account of the death, burial, and battle over the body of Patrick, followed by its eventual burial at Dun-da-leth-glas (Fortress of the Two Broken Fetters), modern Downpatrick. It is well worth a read! The post even includes a photograph of St. Patrick’s grave. Specifically, it is the photograph of the grave that prompted me to write, as it reminded me of my own first encounter with the Saint on his home turf. For many inhabitants of Northern Ireland, and the Downpatrick area in particular, ‘Paddy’s Day’ will not be complete without a visit to the saint’s grave. In 1998, with this in mind, I tagged along with a QUB Archaeology Society tour that visited the site – the only time I have managed to get to Downpatrick on the day. By the time we got to the town and climbed the hill to the Cathedral there was a religious ceremony in progress at the grave. On a slight eminence in the graveyard, to the south of the Cathedral building there was an assembly of clerics and dignitaries, dressed in their robes and finery, being filmed for the local news. Eventually, this group dispersed and we got to examine the graveslab for ourselves. Although still strewn with rather wilted daffodils, the name "Patric" was clearly visible as was the Latin cross with decorated, D-shaped terminals. This stone exuded Early Christianity. Like, perhaps thousands, of visitors before me, standing there I experienced a tangible frisson of connection between myself and the distant past. This was the place where St. Patrick was buried. … nearly heartbreaking to discover that it’s a fake! “The editor is pleased to be able to state that all arrangements have now been made for placing a suitable monument over the reputed grave of Saint Patrick in the cathedral yard at Downpatrick. Thousands of people visit this spot every year, and view with regret its neglected condition. This will now be remedied. The memorial takes the shape of a large natural slab of granite from the Mourne mountains, which will completely cover the site. 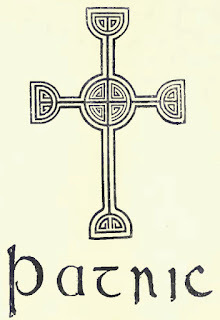 Upon its surface will be incised an early Celtic cross, and the name "Patric" in Irish characters. This will be in keeping with the century in which the saint died. All parties are contributing to the work, which will entail considerable expense. Subscriptions for this object should be sent to the editor, who will give a full account and a sketch of the slab, together with a list of the contributors, in a subsequent number of this journal. 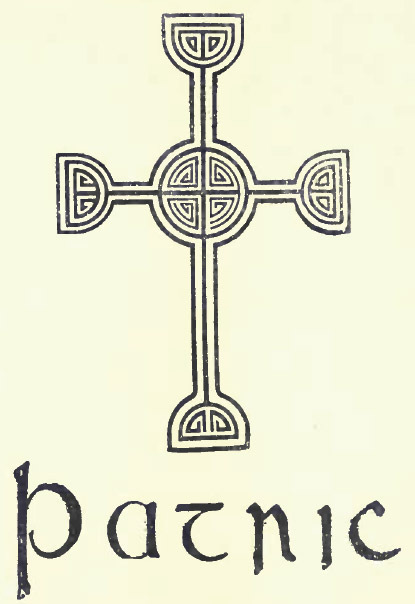 When the town cross of Downpatrick was restored, a few years ago, the necessary sum was subscribed and expended by the editor, and he feels assured a similar result will ensue in the present instance, although a much larger sum is required.” (Bigger 1900a). 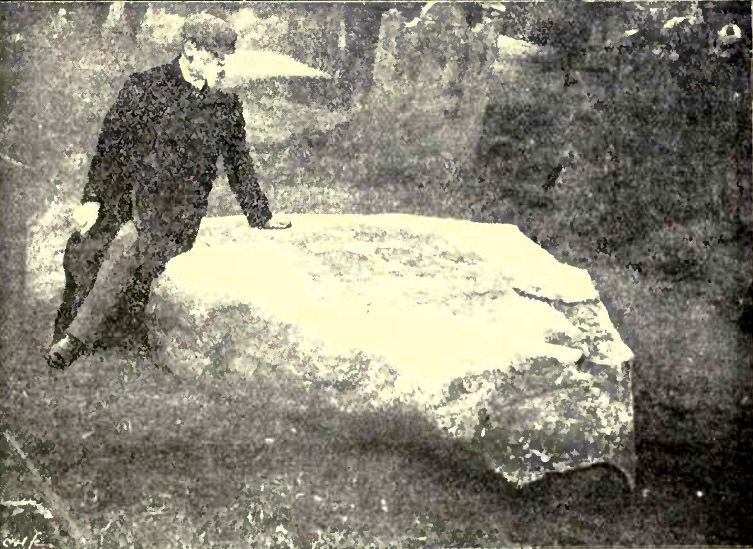 Things must have moved swiftly indeed, as in April of the same year, Bigger was able to report that “The monument over the reputed grave of our National Saint at Downpatrick has now been completed.” (Bigger 1900b). The paper goes on to report that a stone, weighing several tons, was moved from Stieve-na-Iargie, near Castlewellan, Co. Down. The cross carved on the flat, upper surface of the stone was modelled on one from a 6th or 7th century gravestone, discovered by Bigger at Inchcleraun Island, on Lough Ree in the river Shannon. Only the name ‘Patric’ was added as there are no definite dates of birth or death for the Saint. Even moving the block was no small task. Bigger notes that it took twelve men fourteen days to move the stone “from its original site to the country road.” The whole operation, including moving the stone, setting it in concrete, and having it carved, cost £45. While he was initially worried that the public subscription to the fund would not meet this amount, the final total raised was £47 14s 0d. Bigger was also keen to acknowledge that the sources of the money came from ‘all creeds and classes and many different quarters’ – a true cross-community endeavour. Architectural advice was provided by W. J. Fennell, and the Downpatrick building firm, S. & T. Hastings, carried out the work. During the preparation of the ‘grave site’ three fragments of a broken cross were recovered. Although searches were carried out to recover further portions, they were in vain. Bigger notes that the fragments were placed in the cathedral for safe-keeping, until such time as more pieces could be located and a reconstruction attempted. While Bigger was involved in many aspects of, what we would now term, cultural heritage, his involvement with the grave of St. Patrick appears to have left a lasting impression in the minds of his contemporaries. In his lifetime, he was a committee member of the Belfast Naturalists' Field Club; he revived and edited the 2nd series of the Ulster Journal of Archaeology; he sat on the Executive Committee of the Gaelic League; he founded the Belfast College of Irish; he was a member of the Royal Irish Academy, to name but a few. However, in his obituary in the Journal of the County Louth Archaeological Society, it is the erection of St. Patrick’s gravestone that the anonymous writer chose to mention first. This St. Patrick’s Day, if you can’t stay away from the green beer, raise a glass to St. Paddy himself. But spare a thought, too, for the man who helped promote and protect the Saint’s possible last resting place: here’s to Francis Joseph Bigger – may his ‘fake’ gravestone continue to stand as a timeless and eloquent memorial to Ireland’s patron Saint, and may it continue to inspire and touch future generations, filling them with an appreciation of our shared heritage. Bigger, F. J. 1900a ‘Miscellanea: grave of Saint Patrick’ Ulster Journal of Archaeology 6.1 (2nd Series), 59. Bigger, F. J. 1900b ‘The grave of Saint Patrick’ Ulster Journal of Archaeology 6.2 (2nd Series), 61-64. Volume 6 of the Ulster Journal of Archaeology is available, along with most of the 1st and 2nd series, to download as a PDF from Archive.org. Similarly, the Annals of the Four Masters and the Annals of Ulster are also available. A slightly annotated catalogue of the 1st series of UJA is also available on my personal website: here. It is hoped to add similar resources for the 2nd and 3rd series in the near future. There is another blog post by Cultural Heritage Ireland on one of the earliest representations of St. Patrick on the cover of the Domhnach Airgid: here. I also recommend the article in the Irish Times on the botanical problems and historical vicissitudes of the shamrock. Know Thy Place have a post about Croagh Patrick, Co. Mayo, and its place in both Christian and Pagan observance. Finally, there's an interesting piece by Rt. W. Bro. Robert T Bashford on the importance of St. Patrick as a symbol and inspiration within Irish Freemasonry. Check out Vox Hiberionacum's excellent blog post, comparing the realities of St. Patrick and the enduring myths: here. The gravestones from Inchcleraun Island, and their adventures (including being smuggled to the United States and being the focus of a joint FBI/Garda sting operation) is chronicled in a truly gripping paper by Paolo Ciuchini: here. The Price of Patrick: Fifteen Men (On a Deadmans Chest) , examining Patrick's sources of finance - absolutely excellent read! Part 2 is a similarly good read! Voices From the Dawn VR Tour of the gravesite: here. Preface: I am very pleased to introduce Duncan Berryman, our latest guest contributor to the blog. Duncan is a post-graduate student at QUB, and is currently working on his PhD: ‘A documentary and archaeological investigation of the buildings of manorial curiae.’ He is currently the editor of the Ulster Archaeological Society’s Newsletter. You may also follow him on Twitter. The February lecture of the Ulster Archaeological Society was given by Dr. Emily Murray. 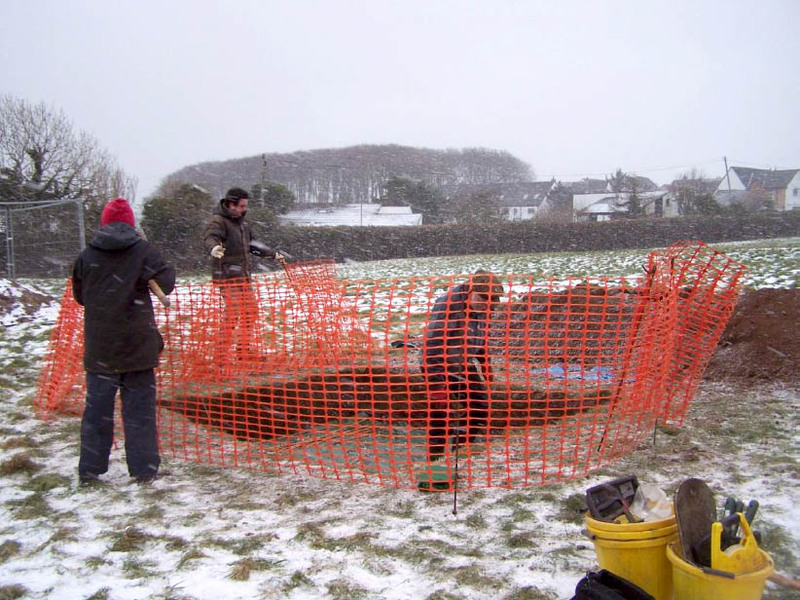 Emily has worked for the Centre for Archaeological Fieldwork (CAF) at Queen’s University, Belfast for a number of yeas and has been involved in a large range of excavations. She has specialised in zooarchaeology and has a wide range of publications. Recently, she has presented history programmes for BBC and UTV, most notably, the BBC series Blueprint. Ballycarry lies a few miles north of Carrickfergus, Co. Antrim, and occupies an elevated position, overlooking Larne Lough to the east. There are many archaeological sites around the village, the largest being a scheduled enclosure fossilised in field boundaries to the west. A 1970s aerial photograph indicated that the semicircular enclosure may have once been a complete circle, indicative of an early Christian monastic enclosure. This was supported by the presence of Templecorran church to the north of the site, which was recorded in the papal taxation of 1306-7; the present remains are mainly sixteenth-century and it fell out of use in the seventeenth century. Geophysics carried out to the east of the church in the 1980s proved inconclusive, suggesting there might be a bank or a change in the underlying bedrock. A bank and ditch were uncovered by excavations in advance of housing construction, but there was little dating evidence and a medieval wall was found to overlay the bank. The only pottery found was late medieval and there was no evidence of early medieval occupation. The excavator believed this was a Neolithic bank and ditch. In 2008, the owner of the land within the scheduled enclosure wished to develop the area for housing. Dearne Valley Archaeological Services Ltd. (DVAS) was contracted to carry out geophysicical surveys across the enclosure. This survey showed up a number of features within the fields, but the most interesting was a large square feature with projections from two of the corners. DVAS suggested in their report that this feature may have been a tower house. However, as the feature measures 33m by 37m, the dimensions are simply too great to have been one. It is much closer in style to a sixteenth- or seventeenth-century artillery fort, such as those illustrated by Richard Bartlett. They were probably constructed from earth and sod and some were later replaced with stone and lime. There were no documentary references to a fort in this area and there was no field evidence for this structure. CAF were tasked by the Northern Ireland Environment Agency (NIEA) to investigate the site and ascertain the nature of this feature. A more detailed geophysical survey was carried out over part of the site and a number of small trenches were opened up over the anomalies revealed by the survey. The geophysics supported the findings of the previous survey and the trenches revealed how shallow the soil was in this area. Six trenches were opened in total, but trenches 1 and 3 contained no archaeology. 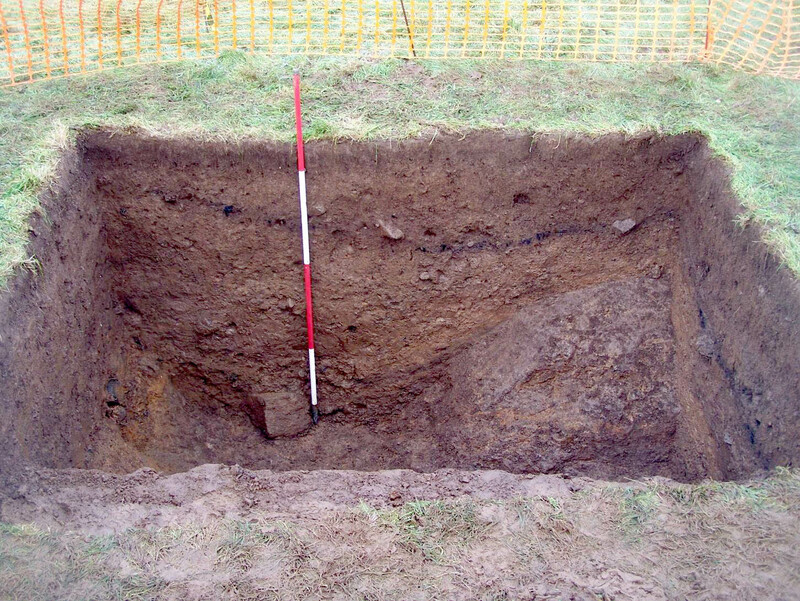 Trench 4 contained a rock cut ditch, 3m wide and 1.5m deep. There were very few finds in the fill of the ditch, indicating that the associated structure was built of earth and sod, but the trench did not extend into the interior to find the bank. Trench 6 revealed the join to the square ditch and the corner bastion. There was possible evidence of slighting of the fort, but again the ditch fill was sterile – there were only a few fragments of clay pipes in the upper layers of the trench. There was also a number of prehistoric flints found, suggesting a prehistoric presence in the area. This leaves the question of who built the fort. The earliest likely period of construction was during the Nine Years War (1594-1603). This was the same time as Bartlett was drawing his maps of Ulster. The Ballycarry fort is similar to many of Bartlett’s drawings. It is not known what an Irish fort from this period looked like. Walter Devereux, 1st Earl of Essex, was known to be based at Carrickfergus and Ballycarry would have been a good site for the defence or attack of Carrickfergus. The second possible phase was the Plantation period. There are no documents relating to the plantation of Ballycarry, as it was planted by Scottish settlers. But the dimensions of the fort are approximately right for a Plantation bawn. 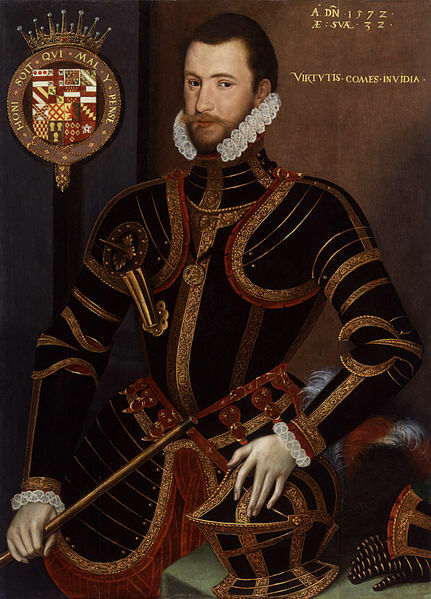 The land was granted by the O’Neils to John Dalway and was regranted to Dalway, by the King, in 1609. Dalway then granted the land to William Edmundstone. The Edmundstones took up residence at Red Hall, north of Ballycarry, which contains the remains of a tower house. Part of the grant of land stated that Edmundstone was to build a bawn in the area of Ballycarry. It is possible that William’s brother, James, may have taken up residence at Ballycarry, while his brother rebuilt the house at Red Hall. The other possible resident of a bawn at Ballycarry is Rev Edward Brice, the first Presbyterian minister in Ireland, who came to Ulster with the Edmundstones and set up a church in the area. The townland names within the Templecorran area were changed at the time the Edmundstones acquired the land around Ballycarry and the townland boundaries may have remained quite fluid until the nineteenth century. The third possibility that it was built a fort during the Confederate Wars of 1641 to 1653. An example of a fort from this period is Hillsborough Fort. However, most of the activity in these wars was in southern Ulster and the area around Carrickfergus was little affected by events in this period. The Williamite Wars of the 1680s is the last period that was likely to have seen the construction of the Ballycarry fort. 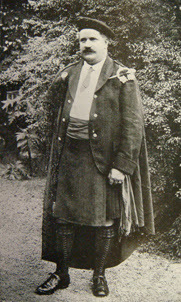 It is recorded that Colonel Archibald Edmundstone of Red Hall was involved in the creation of the ‘Council of Five’. The sizable army that Edmundstone and the Council raised besieged Carrickfergus. Later, they lost a battle known as the ‘Break of Dromore.’ The fort at Ballycarry is very similar in plan to that at Fortwilliam in Belfast; although, it is possible that this is from a different period. Of these possible construction dates, the most likely are during the plantation of the area by the Edmundstones or during the Williamite Wars. However, it would only be possible to have a clearer idea of the date of the structure through further excavation. 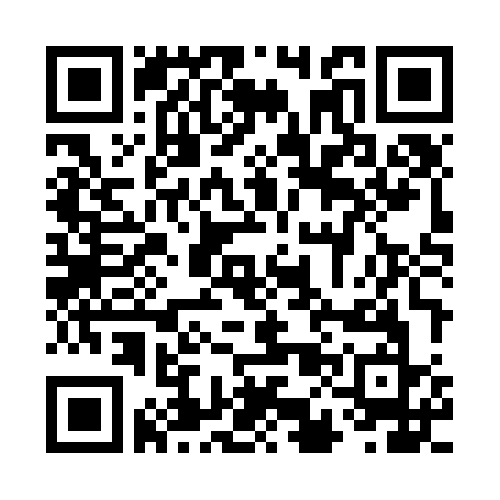 The Data Structure Report (DSR) for the site is available as a downloadable PDF: here. I recently attended one of the PCC Lunchtime Seminar Series talks (Booms and Busts in Europe’s Earliest Farming Societies given by Prof. Stephen Shennan) at the School of Geography, Archaeology and Palaeoecology at QUB. It was a fascinating talk that I enjoyed very much and I decided that I would make every effort to attend the next one. Yesterday (6th March 2012) we had Dr. Jessica Smyth, currently of the Organic Geochemistry Unit, in the School of Chemistry, at the University of Bristol, speaking on the topic of lipid analysis and their application to the study of the Irish Neolithic. She began by introducing the topic of lipid analysis, explaining how it involves the investigation of surface and embedded fats to reconstruct past diets. This field of research was largely pioneered by Prof. Richard Evershed and Smyth explained how she is working closely with him on this post-doctoral research project. She explained that one of the thrusts of her PhD research (Neolithic settlement in Ireland: new theories and approaches, completed at UCD) was to provide a counterpoint to the traditional narrative of the Irish Neolithic. In the past much of the debate had centred on the megalithic tombs and the relatively small number of excavated houses. However, by the early to mid 2000s, much new and challenging evidence was being uncovered as part of the large infrastructural projects and the topic was ripe for re-evaluation (See my take on the benefits of the ‘Celtic Tiger’ years here). One of the bounties of the ‘Celtic Tiger’ period was the vast increase in recovered ceramics, many of which may have been suitable for lipid analysis. Following on from her PhD, Smyth applied to the Marie Curie Actions foundation and was awarded a Marie Curie Intra-European Fellowship for Career Development for lipid analysis for the ‘SCHERD’ project. ‘SCHERD’ stands for “Study of Cuisine and animal Husbandry among Early farmers via Residue analysis and radiocarbon Dating” and, as these things go, is a pretty snappy title for the project and gets all the main points across. The first question that Smyth posed was ‘why is it important?’ She emphasised that the Neolithic is a significant stage in human development with the introduction of megalithic architecture, farming, and generally increased social complexity. Lying at the edge of Europe, Ireland is also chronologically and geographically at the end of this process, which makes an even more interesting research proposition. She explained how her research interests partially overlapped with those of the LeCHE group, a confederation of researchers examining the origin of dairying in Neolithic Europe through the use of lipid analysis, DNA etc. However, their research focuses on central and south-eastern Europe, leaving Ireland previously unstudied. The aims of the SCHERD project are to firstly identify the contents of the pots via lipid analysis. This is particularly important in the case of Ireland where generally poor preservation of animal bone has constricted our ability to understand some of the developments and mechanisms of Neolithic agriculture. In this way the analysis of lipids may be developed for use as a proxy for the economy of the past. It is also hoped to distinguish patterns of regional variation that may shed light on differing diets, economy and traditions. It is also hoped that, similar to the research carried out by Mukherjee et al. (2008) for England, that diachronic changes may be discerned, such as a change in emphasis on cattle rearing to pig production. Another aim of the project is to provide more secure date markers for the Irish Neolithic by directly dating surface and absorbed residues from selected vessels in key assemblies. In this way, it is hoped to add to or, assist in the revision of, Bayesian chronologies for the Neolithic, a process begun with the volume Gathering Time: Dating the Early Neolithic Enclosures of southern Britain and Ireland. Smyth also highlighted the problem that much of our chronology of the Irish Neolithic is relatively poor as it is based on typological assessments, chiefly of changing pottery styles. For all of these reasons, the chronology requires urgent revision and the SCHERD project hopes to play a prominent role in that process. Smyth outlined her sampling regime of 15 key sites, spread across the entirety of the Irish Neolithic. In the Early Neolithic her sites include two enclosures (Donegore Hill, Co. Antrim, and Magheraboy, Co. Sligo) and five houses (including Ballygalley, Co. Antrim, and Monanny, Co. Monaghan). The sites from the Middle Neolithic included one enclosure (Tullahedy, Co. Tipperary), two pits (including Goodland, Co. Antrim), and one pit/spread. The late Neolithic sites examined by Smyth include one enclosure (Ballynahatty, Co. Down), one spread (Longstone, Co. Kildare), one house (Ballynacarriga, Co. Cork), and one pit (Lowpark, Co. Mayo). To ensure that a statistically viable sample was investigated, where possible, a minimum of 30 sherds were examined from each site. As Smyth points out, the lipid analysis process is destructive. However, she argues that considering the potential rewards in terms of new data and insights, the removal of 2-3g of pottery per analysed sherd is a pretty minimal price to pay. The process of preparing the sherd is as follows: the surface is cleaned with a modelling drill to remove all forms of surface contamination. To release the lipids from the clay matrix of the pottery, the sample is ground into a fine powder. The resulting dust is placed in furnaced glass phials and solvents are added to release the lipids. The solvents used are most usually of the form of chloroform/methanol compounds. After some time the resulting complex mixture is purified and separated. The resulting Total Lipid Extract (TLE) amounts to approximately 2ml. This is kept in refrigerated storage and all analyses are conducted using small portions of this core sample. The TLE is further treated to make it suitable for use in various tests, including use in a mass spectrometer or a gas chromatograph. Only once all of these steps have been completed can analysis actually begin. Smyth explained that one of the research aims pursued by Prof. Evershed was that extensive experimental work was necessary to provide a library of lipid signatures that would allow researchers to confidentially infer the former presence of fats. She showed a number of chromatograms showing Triacylglycerol signatures (TAGs). She also explained how, over time, these degrade into Diacylglycerols (DAGs) and then into Monoacylglycerols. Finally, these will degrade into simpler, free fatty acids. Lipids recovered from archaeological sherds are most usually of this latter type. It is estimated that of the original volume of deposited lipids, only 1% is likely to survive. Some of the sites investigated show excellent rates of survival (such as Tullahedy, Co. Tipperary), though survival rates are thought to be related to variables such as climate and temperature etc. As an example, Smyth cited research work carried out in dry countries, such as Greece. Here, less than 10% of sherds retained lipid traces. Experimentation has shown that there is vast and rapid degradation of the lipid remains on sherds stored in aerobic conditions over a 40 day period. It is for this reason that the sherds selected for this form of analysis should come from sealed, anaerobic contexts. Smyth also noted that the storage of sherds in plastic bags (extremely common these days) may also leave a lipid signature on the pottery. Her concern is that while it is not an insurmountable problem, it does need to be noted and it may also mask genuine archaeological signals. In examining what makes a high quality sample, Smyth noted that upper body sherds and rim sherds have shown the best level of survival. At face value, this seems counter intuitive as this is the region in least contact with any boiling liquids in the pottery vessel. As noted above, sherds from sealed, anaerobic contexts are also preferred over finds from the plough soil etc. It is also important that finds are well archived and are retained with their meta data, indicating their contact with plastics and other forms of post-excavation processing. While, from a chemical point of view, the need for sherds from well stratified deposits is not essential, it is of the highest archaeological importance so that the fullest data may be relayed back into our site models. Finally, it is always good to have a complementary faunal record or other proxy data against which to compare results. Addressing the question of the feasibility of this project, Smyth noted that earlier work on the Tullahedy, Co. Tipperary, assemblage reported a rate of five out of six analysed sherds retaining lipids. At another Middle Neolithic site on Rathlin Island, Co. Antrim, 50 sherds were analysed. This showed a recovery rate of 28 of the 50 analysed sherds containing lipid residues. Smyth was also keen to stress that, with 14 months left to run, she is still at a relatively early stage in her project and the results she has thus far obtained are preliminary in the extreme. With regard to the site at Donegore Hill, Co. Antrim, the recently published monograph and the Gathering Time volumes have provided a secure dating range. Given the enormous quantity of recovered ceramics (c. 45,000 sherds), only the rim sherds were formally analysed. These were estimated to represent approximately 1,500 individual vessels. Unfortunately these sherds were unavailable for lipid analysis. As none of the body sherds were identified to individual vessels, a selection of fabric types was selected, spread across the entirety of the site. At the Neolithic house site at Ballygalley, Co. Antrim, the upper body and rim sherds were available for analysis, though the results of these analyses are yet to be completed. The enclosed Middle Neolithic settlement at Tullahedy, Co. Tipperary, produced a very rich cereal assemblage – in fact it is the most abundant assemblage of its type throughout the entire Irish Neolithic. However, the site had remarkably poor bone preservation. Earlier investigations of some sherds from Tullahedy confirmed the presence of free fatty acids on a high proportion of the examined sherds. While early results are promising, she was quick to stress that further analysis, including isotope ratio analysis, would be necessary to confirm them. Looking towards the future of the SCHERD project, Smyth hopes to document the changing nature of Irish agriculture over time. Evidence from such sites as the Céide Fields, Co. Mayo, and Kilshane, Co. Dublin - the latter with its exceptionally large Late Neolithic assemblage of animal bone – have been taken to suggest that there was a move away from a cereal-based economy to a stock rearing economy over the course of the Neolithic. Smyth believes that with enough good quality samples, and sufficient time on the various machines, the SCHERD project can make significant contributions to the state of our knowledge. In the question and answer session at the end of the presentation, Smyth was asked if it was possible to date lipids directly, using radiocarbon dating. She replied that it did appear to be possible, though they had not attempted it so far. For example, some of the sherds, especially those from Donegore Hill, had produced over 5mg of lipid residue, more than enough for an AMS date, so the potential is definitely there. Smyth was also asked if it was possible to distinguish between sheep and cattle in the lipid residues. She explained that it was, though the analysis of subtle differences in the signatures of Triacylglycerol (TAGs) and Diacylglycerols (DAGs). One other contribution related to the description by Peacock, during an 18th century tour of the Hebrides. He had witnessed the native islanders creating coil-built pottery vessels and firing them in open hearths – essentially the same manner as in the prehistoric past. However, Peacock noted that before they were placed in the hearths, they were filled with milk, which was allowed to evaporate during the firing process. The question then was that could this form of activity be what we are witnessing, rather than the continued use of the vessel to hold a variety of different cooked meals. Smyth admitted that it could complicate matters, but that it was most likely that the firing process would not just evaporate the milk, but destroy any lipid residues in the process. One further intriguing problem was raised during this discussion. This was the discovery of certain keytones in some samples that indicate that the contents were fired to a temperature over 300°. While it is thought that the average open heath would struggle to achieve this temperature, the reality is that little food would survive for long even if it could be achieved. As Smyth stressed throughout this presentation, she is currently only able to present preliminary results. Nonetheless, she has already produced some interesting, and potentially controversial, findings. I, for one, eagerly await her return trip to Belfast when she has been able to fully verify her findings and process more samples. I hope that I have done justice to Jessica Smyth’s lecture and managed to convey the gist of her ideas and results. Nonetheless, I do sincerely apologise if I have misrepresented or misquoted the speaker. If so, please feel free to contact me, and I will endeavour to set the record straight. I have not been able to give the full references to any of the literature referenced in the lecture – sorry. Some photographs of the 1984 season of excavations at Donegore Hill are available for public viewing, at The William Dunlop Archaeological Photographic Archive. Three Billboards Outside University College London: A case of approved plagiarism by Prof Andrew Bevan et al. The archaeology of the Great Famine: time for a beginning? Piece of the True Cross Discovered? Does it Matter? Another kiss from death’s sweet breath?